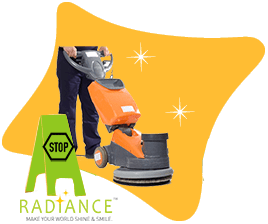 Radiance Space provides fit-to-made solutions offering professional deep cleaning services in Delhi-NCR covering Pan Gurgaon, Noida and Faridabad. We offer diverse range of deep cleaning services for your home, offices and commercial spaces to breathe new life into them and change the whole look and feel. Our deep cleaning operatives employ high-end technology that will lift even the most stubborn stains promising highly exceptional deep cleaning home services not just in Delhi, but also the capital region including Noida, Gurgaon, and so many more. We pride ourselves on being one of the rare companies to use state-of-the-art automated machines from unprecedented names in the field of technology like Task (Germany), IPC (Italy), Bosch (Germany) and 3M (US). Coupled with our expert supervision, we merge efficiency with enthusiasm to articulate cleaning chores promising exceptional services and 100% customer satisfaction. At Radiance, we specialize in bespoke deep cleaning of offices and commercial spaces in Delhi and NCR. No need to further invest in new furniture for your office and end up adding your capital expenditure. Leave all your furniture woes to our professionals and special cleansers while we carefully rub their stains off and leave it in its full glory. To achieve this, experts at Radiance use sanitizing, scrubbing, polishing, special cleansers and buffing using high end German machines and eco-friendly cleansing solutions. We offer a diverse range of deep cleaning home services and allied treatments to perfectly clean all areas and items at your property. Our unique furniture enhancement and upholstery cleaning service offer to give your furniture the perfect cleansing and reviving its shine back, thereby adding cherry to the cake – so to say! For deep cleaning services, we use extensive range of Diversely Cleaning agents, a leading brand in sustainable cleaning solutions. We employ their ‘R’ series for rooms, washroom and deep cleaning of commercial spaces and the ‘Suma Series’ for kitchen and pantry areas. We utilize premium technology tools and machines that include single disc scrubbing and polishing machines, industrial-grade wet and dry vacuum cleaners, carpet cleaning machines, and foam generator machines, hand-buffing and scrubbing machines among others. The deep cleaning of your home, floor, sofa, carpet and furniture is achieved with utmost perfection. This service not only cleans and sanitizes, but also breathes life into each item of your facility. Scrub – This includes preliminary dry dusting and cleansing to remove the top layer of dirt and dust mites from the surface of the item. 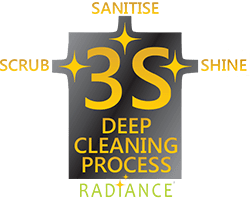 Sanitise – Special cleaning agents are applied using micro-fine dusters to intrinsically disinfect the item from germ contaminations and pathogenic microbes, while simultaneously extending its life. Shine – Finally, a top layer of polish is applied to the item and then buffed to enhance its visual beauty. Whether it is deep cleaning of homes, offices, commercial spaces, sofa, carpet, floor or furniture, we are just a call away!